Joel RaskinB Bar and Grill, 40 East Fourth Street. When I sat down the other day to have lunch in the garden courtyard of B Bar and Grill, at 40 East Fourth Street, I did the natural thing. I took a seat facing out towards the Bowery. But then I thought: Why am I looking at traffic when I could be looking at the garden? And so I turned my back on the street. Here is what I saw: A light breeze stirred the branches of the six great, spreading locust trees which grow inside the courtyard. Straw baskets, some as big and broad as beehives and others the size and shape of Chinese lanterns, hang from the branches, and the breeze had set them in gentle, bobbing motion. It was a warm day, but the broad leaves filtered out the sunlight and cast dappled shapes on the brick floor. The garden is enormous — a 3,000-square-foot space where a gas station once stood — and the sounds of talk and clattering silverware drifted up towards the sky. 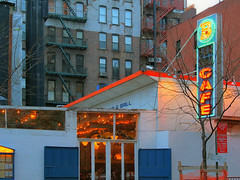 The East Village is not a serene place; but B Bar is. There is a very complex, and very charming, interplay between “indoors” and “outdoors” at B Bar. Only one half of the roof is open to the sky; the other half is covered by a bamboo trellis, which leaves stripes rather than blotches of sunlight on the brick tile of the ground — that is, floor; no, ground. The surrounding wall is pierced by wide openings which offer prospects of Fourth Street and the Bowery. At B Bar you are embowered, but your beloved street-world is very much with you. Step through the wall, and you’re there.